OUR PRICE: $72.95 - Join Rewards Get $7 Dance Dollars On This Item! 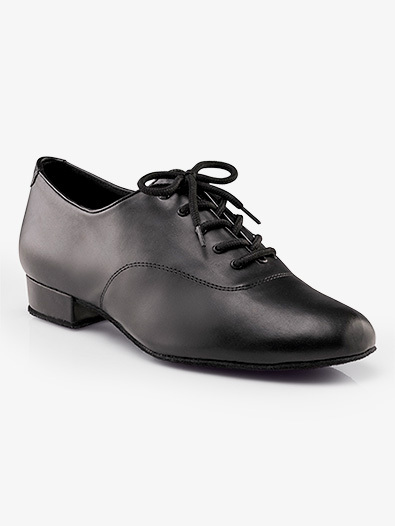 This social dance shoe is ideal for all standard ballroom style social dances! Features include soft, supple and durable PU upper, flexible suede sole, 3/4 shank, shock absorbing sponge insole, strong heel counter for maximum ankle support and a 1" heel with suede covered toplifts for shock absorption. Suggested Fitting: Same as street. The shoes are definitely at least 1 size too small. The sizing chart says same as street. I even held it heel to toe with several other shoes and they were at least a half inch smaller. They seem like great shoes so I will re-order although am not happy about paying shipping for the return. Have been dancing for about 3 months without dance shoes, sneakers or dress shoes. These shoes made a world of difference. They are comfortable and light weight. Much easier to dance in! I am 9.5 wide. I am worried that the shows may not fit. How does the return policy work? Hello, Thank you for contacting us. You can return the shoes within 30 days from the ship date. The item must be in new resalable condition.